51, of Kennebunk, Me. ; assigned to the USASOC, 352nd C.A. Command; died July 1 in a traffic accident on Highway 8 in Iraq. 1stSgt Coffin spent 23 years in the military and always took care of his soldiers. To honor 1SG Christopher D. Coffin, his widow, Betsy Coffin retrieved this stone from the coast of Maine on Kennebunk beach. This beach was Chris and Betsy’s favorite place to spend time together and take their dog. This is the spot where Chris and Betsy have shared so many memories together and felt at peace. Approximate weight – 4 lbs. Watch this video to learn why this stone is significant and what it says about 1SG Chris Coffin. The stories! So fascinating and inspiring. I love all the life stories of our amazing fallen heroes. THank you David for introducing us to our heroes and their loved ones. Looking forward to meeting all of you in May! I had the honor of watching over the Stone of your Husband, Army 1st Sgt Christopher D Coffin. I participated in a military based endurance event called GORUCK. This particular event was the longest I have done, being that it is actually comprised of three different events. It is called the GORUCK HCL. The first event was the GORUCK Heavy, this is a 24 hour team based event. This is billed as the Ultimate Team Event by it’s creators. During this event Christopher’s stone along with several others were combined to create our Team Weight. The Team Weight has to be 50 lbs and must be carried at all times and will be shared by all involved. It is simply awesome to see the care that is taken with this weight when the others are told what is in there and who are represented. This weight was carried with us for around 50 miles during the Heavy and at times was fought over as to who would have the honor to carry the weight next. After this event we had a 5 hour rest and refuel period before we began the GORUCK Challenge. This is another team based event which lasted almost 12 hours and somewhere around 18 miles. There were 10 of the finishers of the GR Heavy who came back for the GR Challenge. The Team Weight for this only needs to be 25lbs. For this Christopher’s Stone was transferred to my Ruck(backpack), to help drop the 50lbs down to 25 lbs. Once again reverence was shown to the Team Weight, and once again we would fight and argue over who gets it next. When the GR Challenge was complete, we had a short 3.5 hours before the last event. The GORUCK Light is the entry level event. Still team based, it is billed as never easy, but always Fun. This event lasted 5 hours and covered around 16 miles. I still carried your husband’s stone with me through this event. It was during this event that I connect the most with the ideals your husband lived by. We had a wonderful lady “shadow” us through our previous two events. (Shadowing is basically following along, taking pictures and watching the pain and suffering we go through during the events) She signed up for the GR Light portion of the HCL. The Light started and we were instructed to jog for a bit. She struggled a bit and wanted to quit. Myself and the other 9 who had been through the previous two events would not let her. I thought of what you said in the video about how he would always help those in need. Especially how he sometimes went before even being called. There was no way I or any of us would leave her behind. She pushed through and finished. It was amazing to see how a little push or even a pull at times made a tremendous difference to her and helped her to finish. I think about how many lives your Husband touched in the same way. How many soldiers and civilians were better people for having met him and spending even a short amount of time with him. I will think of him as I am running or training on the beach. I will think about him whenever someone needs help. I will think about him when I want to call it a day before it is done, I will remind myself that Army 1st Sgt Christopher D. Coffin would always live life to the fullest, and that I should do the same while I still have the freedoms and opportunities because of great men like him. Thank you to Army 1st Sgt Christopher D. Coffin for your service and ultimate sacrifice. And thank you Betsy for your sacrifice and for sharing your husband’s story and his Stone with us. We will make sure Christopher is not forgotten. This was an amazing weekend. Having the honor of carrying Christopher’s memorial stone with us from Gardner to you in Millinocket was amazing. We had the pleasure of learning about your husband. Meeting you and having the opportunity to spend time with you and sharing your memories of your caring, funny and loving husband. My husband Peter was fortunate enough to have met your husband right after 9/11. When we first met Maj. Cote we were so impressed with his vision of the Summit Project we were committed instantly. The feelings I had when Peter and I received Chris’s memorial stone from the Wiggins who carried Chris’s memorial from Portland to Gardner was one of pride, honor, sadness, and a whole lot of goosebumps. I felt like we had a 3rd rider on the bike. When we drove through Millinocket and the town welcomed us I was brought to tears from the pride, honor and respect that everyone showed. Your husband gave the ultimate sacrifice for us to have this freedom. As we rode on I began wondering how our meeting was going to turn out. I went over and over in my head what I wanted to say to you. I wanted to express how honored I was to be able to show your husband will not be forgotten by myself, Peter and the Patriot Riders. I had a beautiful speech planned, but when I saw all the families waiting I became so emotional that I forgot everything I wanted to say to you. As time went on over the weekend we were able to spend some time together and I enjoyed it very much. I am very appreciative of the commitment and sacrifice that you gave as a wife of a soldier. Thank you for sharing your stories and your husbands memories. This was the most amazing, emotional, beautiful weekend I have spent in a while. Chiristopher will not be forgotten and will go on many other rides with the Patriot Riders and most of all with Peter and I. We would also be honored if you would like to attend any event with us. Thank you for sharing his story and his life with us. Hi Betsy, I’ve been trying to compile my thoughts and feelings about this weekend for a few days now… and I just keep failing trying to explain it… Every time I think I’ve expressed what I felt adequately, it still seems very weak at best. Please let me start by saying thank you. Thank you for allowing us the honor of carrying this stone with TSP and giving us the opportunity to learn about the life of your husband 1SG Christopher D. Coffin. When I first heard about TSP I saw something that combined my love for hiking, respect and appreciation for our service members, and a way for me to participate in supporting families of the fallen, it was a no-brainer. I wanted to be a part of it. Looking back now after this weekend, I really had no idea how big of an affect this was going to have on me, and other people that I had never met before. When I submitted my application to help out with TSP I didn’t expect to be on the list of hikers. But once I was notified that I would be allowed to hike I re-signed up at the gym and started training. About three years ago I had an un-expected medical emergency and because of that – I was supposed to be in the gym more anyway, but I hadn’t been very consistent with it. Once I knew I would be hiking – the TSP slogan “honoring the fallen while challenging the living” took on new meaning and soon became a focus point for me over the months leading up to the hike. Anticipation grew with each email from Dave Cote that gave us more details on the hike. Since I didn’t know any of the fallen personally I assumed that I would be assigned a stone for the hike but while I saw a post from TSP Facebook page the video of Army 1st Sgt. Christopher D. Coffin stuck with me and I asked Dave if I could carry his stone. He wrote me back and said that if it can be engraved in time that I could carry it. I now had a new task – learn all that I could about Christopher’s life. After about an hour of Google searches and reading I was starting to see small glimpses into the life of someone that always looked out for others, loved his wife, his country and his family. I was beginning to have a connection to a veteran that I had not known before – but now will NEVER FORGET. I started to realize some of the effects of TSP already in my life; I was eating better, being more active, and trying hard to be ready to hike Katahdin. This soldier who never met me was having an impact on my life and that really seemed amazing to me! Soon the time came to write our hiker bio and that made me think some more about what I was doing and why, these pause points were very helpful for me to reflect and understand the mission of TSP and the honor of being accepted to participate, in hindsight these “action items” were a memorable part of TSP. Over the next few weeks before the hike I had the pleasure of being able to email you Betsy. Even though we were both busy with work and life in general you took the time to get back to me and respond to my often wordy and not so clearly thought out emails. Thank you for that. Thank you for sharing about Chris with me. I felt horrible when I read that you had to wait for a long while until you found out the details of his passing. But was very encouraged when I read about how he loved you and your dog (Samantha) so much! The story you shared about how he rescued Samantha – my kids already know by heart. Reading the comments from those who served with him and knew him spoke volumes about his life and the mark that he made while he was with us. Those are the things that I will pass on to my family in the stories that I tell them about him. I love my wife very much and make sure to tell her that every day, if it’s ok with you – I might steal a page from Chris and borrow his idea of leaving notes when I’m gone to work. In the two weeks before the hike I had been doing good running, I had bagged some peaks and had lost 5lbs from my goal of 20. I wasn’t where I wanted to be, but I felt good. I got hit pretty hard with allergies and took almost a week and a half off from running – that set me back more than I knew. Dave had asked me to lead team Blue up Katahdin likely due to my previous hikes on the mountain. I’ve lead groups on hike lots of times over the years and my only concern was being physically ready. I didn’t want to let anyone down on the hike, the families, Dave, my team… When I found out a GORUCK’r named Ted was also a lead on our team, I felt confident that he could easily take point on the hike in case I should not be able to keep up. Soon Friday the 23rd was here and I was scrambling around the house getting all my gear ready to go. Friday morning I kissed my wife goodbye asked my kids to pray for me and headed up to BSP! It was time! As I drove up and got off the exit heading into Millinocket, I started to see signs supporting TSP – WELCOME! Maine Heroes are Not Forgotten! Handmade with Duct tape – Welcome Summit Project! It brought up in me a sense of pride to be an American and I felt proud and humbled to be a part this! I felt like walking into every business that had a sign and shaking hands with people and saying thank you! I couldn’t wipe the smile off my face, and that was a good thing. Something inside me was stirring up and the anticipation was building for the event! I followed the signs till I saw TSP logo and followed it to this gem of a place called NEOC! I had been up here countless times and never knew this place existed, what a cool place! One of the first people that I met was Ted – he looked a bit more clean shaven than his profile picture so I wasn’t sure it was him, but he said hi and introduced himself. He had a big smile on his face and looked to be in the know already helping Dave Cote with things. I made my way up to the table and gave them my name and my weekend began. The lady asked me what stone will you be carrying? I couldn’t even think for a minute, it took me a few seconds and I said Christopher Coffin. I was given my bed assignment and headed out to the cabin. While I was going over my pack and setting up my stuff in the cabin, someone mentioned that the Patriot Riders were coming early and we should go out now to see them. I had read up on this group and was excited to see them drive in. The bagpipes started to play and you could hear their engines before you could see them coming. I had my camera ready and it was awesome to see them drive in with the stones. For the first time I saw the stones in person I wasn’t sure where I should be or what I should be doing, Dave was just rolling with it. Matching up bikers to the families of the fallen and I was just watching and taking pictures of the whole thing as it happened. Bikers were hugging and people were crying and smiling as the stones were transferred from biker – to family – to the table to rest. It was more emotional than I would have thought – even as an observer. These bikers really took this to heart and were very serious about the mission they had just completed. I’m very thankful to have been there. That night was busy but action packed, we met with the head of Baxter State park, the other hikers, and Dave. Finally we were tasked with taking our stone back with us for the night to reflect on OUR fallen hero and get it packed up and ready to go for the morning. Picking it up for the first time, and thinking about Chris and his life while I packed my bag was another “action item” that I won’t soon forget. I’ve packed my pack many times, but this was different, I had a mission to complete and it felt good to think that in some small way I could pay respect to his life – I felt proud to be in this group of people that I didn’t know and very honored to be here. I rehearsed a bit what I would say on top and thought of his sacrifice and service to our country. It was very meaningful. I tried to get some sleep and I think I was able to get a few hours in on the couch. I woke up that morning to Dave Cote organizing some volunteer’s outside my window – it was almost go time! The morning of the hike was here and Ted was organizing the shuttle bus and extra rides, handing out the radios and getting ready to go. It was our team’s turn soon enough and we were heading for the trail head. While I had hiked Katahdin 18 times I had never hiked the Owl. I had hiked some of this trail before so I felt confident in that fact and ready to go. I met Mike, Sarah and Sean on the ride over and we jammed to some tunes while we headed for the trail. Ted and Mike headed up a team building exercise that involved pack lifting and introducing ourselves – it was fun and helped us to get to know each other a bit – and get warmed up. We piled into the shuttle and truck and headed out to the trail. Soon we arrived at Katahdin Stream Campground and were on our way down the trail. As we headed off I felt like I was watching myself from behind and started missing things like the sign in post – the photographer asked me if we signed in and I had walked right past it. This is step 1 on almost every trail in Maine, I had done this countless times, but walked right past it. I’m not sure why, but I didn’t feel quite right and I was starting to question what was up with me. As the hike went on I struggled more and more with my breathing and trying to get my heart rate under control. I really started to get down on myself and felt like I was holding up the team and letting them down. I had practiced what I was going to think about while I was climbing, what I would focus on and what I would do. But here I was, out of breath, slowing down the team, and losing focus. All I could think about was keeping up and trying not to disappoint Betsy and Dave and Ted, Mike and the rest of the team that I was supposed to be leading. It was a very odd feeling for me because I have hiked for years – much harder trails than this with much more weight, but I was struggling and couldn’t seem to focus. I finally handed the radio to Mike (because I knew him and Ted would be better to lead the group). I didn’t say much that I remember, I was just disappointed in myself. I should have trained harder, even though I wasn’t feeling good prior to it was no excuse for my performance, that’s about when Ted set me straight. He mentioned that it wasn’t about me, it wasn’t about him but that this was about the families of the fallen and I needed to focus on that and take it easy. It hit me harder than I think I let on, but helped me to regain my focus. Ted was determined to keep our group together as a team and he really was the glue that held us in my opinion. As I went on I made the mistake of getting too far ahead for a bit – feeling the pressure of slowing the team down, then I realized that I was too far and headed back. Another thing I know all too well not to do! Little by little for the rest of the hike to the top, my teammates kept checking in on me – offering to help with some pack weight and sticking with me as I struggled. All things that Chirs Coffin would have done for the other people. I didn’t realize it till later but I saw the virtues of Chris Coffin that day in Ted, Chris, Mike, Greg, Kate and others like Scotti… “slow is easy – easy is slow” thank you BLUE team for your patience and support! When I got to the top and it was my turn to say something about Chirs, I had made a bandanna that wrapped around the stone with a quote from you Betsy that you had emailed to me about what you wanted people to remember about Chirs. I don’t know how much of it I was able to say or if it came out the way I wanted it to, but I hope that what was said was well received and honored him. The hike back down was much easier on my breathing and I felt much better. We finished together and at the end of the trail two ladies had a table setup with lots of goodies to snack on, I don’t know if they were there all day in the bugs but I thanked them for their time and efforts! Once we headed back to NEOC it was time to hand the stones back to the families. After some photos with you and the Patriot Riders who carried the stone up from Portland, another family member pulled me aside… He asked if he could talk to me for a minute and I said sure. He told me that he was aware that I hadn’t carried the stone of his fallen loved one, but that if it wasn’t for events like TSP, and the volunteers and hikers that he wasn’t sure if he would even be able to stay sane from his loss. He seemed to want me to understand that this project helped him grieve and was very important to him… again I was at a loss for words, I think I managed to say “you’re very welcome, but it was my honor to participate”. I really didn’t realize the powerful positive effect of this event on so many people… it was bigger than I thought. I was looking at this a way for me to honor the life of a veteran on Memorial Day but had no clue how big it all was! Betsy thank you for asking me to stay to dinner, thank you for the remembrance metal for Chris, I have shown it to many people and told his story. I wish I had time to kayak on the lake some in honor of Chris, I wish I would have had more time to sit with you at dinner and talk, but thank you! Thank you for sharing your heart and for the gifts that you offered me. After showering and going to dinner and saying goodbye to you and my teammates – I felt bad that I was leaving this group of people that I didn’t even know two days ago. My family was waiting for me at home and I knew I had to leave soon, but some of the events kept pulling me in, I asked Ted and Mike if they could take over the last of my responsibilities for the spirit stone awards and was getting ready to head out. They told me they wanted to see me before I left and so I listened to Dave wrap up his thank you list… Upon hearing the list of people all over that gave for this and gave for that – they saw a need and met it, Patriot Riders bought hikers shirts, companies donated for families to stay for the weekend, banks bought gas for the riders… I just couldn’t help feeling an overwhelming sense of pride and appreciation for being part of this project! On my way out heading home to see my family, Ted and Mike pulled me aside and told me about how they felt about my hike that day. I really didn’t expect them to feel the way they did and the honor they gave me was too much for me to take in at the time. I was told that team Blue was behind them and I will take it to heart and try to earn it as best as I can. I couldn’t have asked for a better group to be with and I will remember this weekend. Thank you team. If you want to skip this long summary of my experience, maybe something like this can sum it up: Often it seems we’re hit hard by bad news all around us… but this weekend I was reminded of something. Something that I know is there but is often unseen. It’s the power of what we as American’s can accomplish when we come together for a cause. It gives me hope for the future! Dave’s idea to support families of the fallen and his mission to “Always Remember” may have more power to effect positive change in more people than he may even realize! I can’t wait to hike again with The Summit Project and the people that were a part of this amazing event! I will “Always Remember” and NEVER forget Christopher D. Coffin and you Betsy, his story will live on with me and my family, his sacrifice will not be forgotten here! This experience, Chad is what our lives here are all about…loving and caring for people. I am so proud of you. Your heart and life will leave an example to your children. Trip Report from RTHB 2014. Race stats: My place was 90th overall. 1600 participants. Top 6% of runners. For my age division 28/312 — Top 9%. 42:15 overall time ; 7:34 split. July 19th, Fenway, USATF certified course. With all 1600 runners we raised $1.54million for service members in New England who suffer from TBI or PTS. This was my FOURTH year running the RTHB at Fenway Park. What an excellent event and an even better cause. I consider it an honor and a privilege. I will do everything I can to help our fallen veterans. Every year has been memorable and I wouldn’t miss a chance to help support veterans — especially those New England veterans who need it most. This year I ran the entire course carrying a stone from The Summit Project. I want to carry the stones and the memories of our fallen heroes from Maine all the way to home plate of our beloved Fenway Park! While helping to serve the needs of living veterans who suffer from combat stress and TBI, I also want to honor a generation of Maine veterans who died in the line of duty defending our country. They did not come back to Maine, and could not take their grandchildren to Fenway Park. I want to take a piece of their spirit to Fenway Park, and I want to take action to share the burden shouldered by our heroes and their families. I completed this year’s RTHB in the spirit of our fallen heroes from Maine. I will climb higher, run farther and work harder to make more connections within our communities and gain perspectives that will help me carry on the work of my fallen comrades towards creating a safer, sounder and more just America. I chose 1SG Chris Coffin’s stone from the MEPS Honor Room on Friday morning around 0600am. Did not know which stone I would carry at first. Many are checked out for other TSP events, but after a few minutes, I picked 1SG Chris Coffin’s stone.. it was perfect. I enjoyed the opening ceremony but was anxious to get going! I left my brother in the 3rd base bleachers and went to the top the bleachers to take a pic and finish my mental preparation. I stood alone to sing the National Anthem. I thought about Chris Coffin and all our heroes. Like Chris I was proud of my country, and like him, I was enjoying this day and making the most of the present moment. My wave, the red bibs, was slated to first to go. As soon as the anthem finished I descended the ramps of historic Fenway park to line up in our starting chute on Yawkey way.. just outside Fenway. Perfect running weather — Could not ask for better. When I run, and I love running and swimming, I notice that after the start, I get into a rhythm. My mind spaces out. My legs are turning over and the body takes over. My heart is pumping, my body goes on autopilot. All systems go. I’ve notived in all my years as s runner, that when my mind wanders, that is my indication that my body systems are fine. Green lights and in range. My mind starts to think of other issues, other ideas, solving problems and maybe even a voice that propels and sustains my body. For some reason a phrase came to my mind on this race. Not sure why. I thought of Chris Coffin on that run, but the phrase that came to me was “Suns out Guns out.” Not sure why, that was my mantra. It is a reference to rolling sleeves in the USMC, but for some reason, that phrase kept entering my brain. The run route was wonderful. With two segments of the run that were out and backs, I was able to greet other runners, especially Marines. I grunted to all of them and said ooh-rah. After a few miles, the stone in my pack was there and I could feel the weight. I thought about those who achieve weight loss goals. I saw the Charles river below me, I monitored my pace and watched ever so slowly that my pace was slowing. My first split was 6 min mile. Not sure the pace of my last mile, but my average split for the entire race was 7:34. It was a small price to pay to honor one of our heroes. The final mile is the return trip over the Mass Ave bridge. It’s one of the most exhilarating finishes. Cross Mass Ave. run to Boyslton.. make two right turns so you are on the final approach on Ipswich street.. ready to enter the Green Monster on Landsdowne Street. The cones funneled us in our beloved Fenway. I knew the finish line was in the park, along the left center filed. I did not let up yet. Pumped and sprinted toward the finish. Just before crossing the finish line, I got close enough to raise my right hand and touch my hand to the Green Monster. With an open hand, I pounded the wall three times to feel the wall, to hear its sound, to feel the resistane and toughness of a vertical plane that has robbed countless homeruns, and is peppered with permanent dings from would be homeruns. That wall was tall and big. From its base I actually thought about the cliffs of Normandy. I thought about the walls we all face in life, walls that appear to be a barrier, and deny our attempts to succeed on first attempts — barriers that might challenge our physical and mental toughness. I thought about Chris Coffin and his dedication to his family, his country his commitment to give back. Suddently, I was there, ready to cross the finish line and rest… just as I crossed, I glanced at the race clock — 42 minutes and 15 seconds. Not a bad overall time. I made a mental note, then I stopped.. I did not drink, I did not jog or walk or think about my body.. I stopped, got down on a kneeled and removed Chris Coffin’s memorial stone from my camelback. I had it wrapped in a small white towel. I unwrapped it, and began to cover the stone with dirt from Fenway’s center field. Red dirt.. I smeared the stone vigorously and saw my hands become instantly dirty. The sweat on my hands, arms and the sweat driping from my face and head made a small mud paste.. I tried to cover Chris stone as quickly and reverently as I could. To me the meaning was to share a piece of this experience with Chris Coffin and all those who he fought for, who might also love Fenway and might want to touch a piece of the park that is normally off limits. I grasped the stone, snapped my camelback, zipped the pouch, then I hand carried Chris’s stone toward homeplate. Along the warning track, I turned left at the 3rdbase foul line, and toward homeplate. I remember a volunteer handing out bottles of water.. I opened a bottle, while still carring Chris’s stone, and with what seemed like one or two gulps, I drained the bottle and disposed of it. I was ready to cross home plate… reverently, and keeping the memory of a Mainer whose life was cut short, and could not enjoy Fenway park, I carried his stone in front of my body, letters out, and crossed homeplate. There were service members in uniform to greet us, I saw the pristine Navy white uniform of Navy sailors and felt bad that a handshake to me, in addition to the other finishers, but particularly me, would soil their perfect white uniforms. I was dirty and drenched, from water, sweat, a tear or two. Like Chris Coffin I finished with smile. Chris always smiled. He always was willing to help others, to think of others before himself. He was a hero, a warrior, a Mainer, a compassionate soldier who adored his wife and loved his country. He is the reason I ran that race today. I felt proud, humbled, exhausted and honored. I hope that in that moment, I was able to honor a hero from Maine who gave his LIFE for this country and I was able to keep his memory alive by challenging myself and living a life worthy of his sacrifice. I had a great run that day. I thank Chris and Betsy and all those who serve a higher calling. I was proud to say, for that moment, that Maine heroes are NOT forgotten. Last week, I had the opportunity of carrying the rock of your fallen one, and I was intrigued. It meant a lot to be able to learn a little about the life and families of the fallen soldiers, that died supporting our country. My class carried other soldiers’ rocks all the way to the summit of Bradbury Mountain in Pownal, Maine. It was definitely a great experience. Everything that I learned about Christopher, it really set something great in my mind. He was a great man. You guys used to spend all of your free time at the beach, taking your dog for walks, and you retrieved your rock from this place. I think that is great. I enjoyed hiking for our veterans, and especially learning about your husband. I hope to be able to do this hike again in the future, because it really meant a lot to be able to contribute some of my time honoring the fallen soldiers, and the soldiers that are currently serving for our country. It takes some courage to be able to risk their lives for their country, and your husband is a very courageous man for defending our country. Thank you very much for allowing people to carry your husbands stone to summits, and I hope I get the chance to do so again. Your son/husband was a brave man. Carrying the rock up the mountain and reading about him changed something for me. I have a lot of relatives that have been in the military in fact, my brother just got out of the Marines. From what I have read it sounds like Christopher liked being outside. It felt like he was with us walking up that mountain. When we got to the top of the mountain you could feel the emotion and nobody really talked unless they were presenting their rock which made everything more powerful. When my friend presented Christopher’s rock I felt proud because we got to find out more about him and then sharing that to a group of people it’s like we were presenting a friend of ours. I know he is missed he sounds like a great man. Your son/husband changed somethings for me. I have never lost anyone while they were in combat, and I could understand how very hard it must have been for you. I don’t know exactly who Christopher was or how his life was but I know that walking with his rock up the mountain I know he was an honorable man, and I am upset that I never got to know someone like him. Thank you for letting me honor his life as much as a high school student could. I will always remember Christopher, he will always be a hero to me. Thank you for have such an amazing man, him volunteering himself to defend his country means a lot. Thank you. My name is Shawn and im eleven years old. Me and my dad carried 1SG Christoper D. Coffin’s stone i carried it up and my dad carried it down to the west peak of borestone mountian. I picked this stone because my dad carried it before and told me his stories. From the experience I have much more respect for those who died in the war for us and Chris was a standout. Chris was a standout because he is a great guy that he always put his friends and family first. I heard about some of his stories and there were three that i really thought were cool. These are it; he befriended a pack of wild dogs in Iraq and fed them his rations. He took Samantha beacuse he was like if you are going to beat that dog i can’t let you have her. Finaly when he took you on a date for the first time, it was on a plane. That was really differant in a special way. When we started it was basicly strait up and if i wasnt doin that for a good cause i would’ve asked to leave. I thought that showshoeing would be allot easier than it was. While I was hiking, my ankles and my legs felt really sore and my whole body and back hurt allot at the end. When we were on top, we got in a group and I been waiting a while for that and listening to the others made me forget what i was going to say but when it was my turn it was like a shock wave surging threw my body and i said what i was going to say but i still didnt know what it was and after everyone spoke and i got home it felt like huge relief and i was happy for doing that. It’s important that we remember about Chris’s life because he gave his life for us to have freedom. One thing is for sure there is no way im snowshooing again unless it is for the TSP. Thank you Betsy for being apart of The Summit Project so i can learn abound your husband. I had alot of fun though and i hope you feel better. We met on an overcast brisk day. It was Sunday April 26th and when I awoke it was exactly 32 degrees. I didn’t know that we would be meeting up later in the day, but as luck, fate and circumstance would have it you entered my life and we got to spend a few hours together getting acquainted quite by accident. You became part of an entourage that has existed for 8 years; how nice that we got to make our maiden trip together. Our lives collided at the 8th Annual Spring Support the Troops bike run that started at the American Legion in York and ended at Bentley’s Saloon in Wells. Your coach was a 2007 Ultra Classic driven by Jason Heft, a Chapter 1 Patriot Rider. He not only coordinated the ride, but we got to lead the ride with him. You and I literally had the best seat in the house. The only one ahead of us was the State Trooper who assisted us in getting through all the intersections unabated. But Chris, that’s jumping ahead. We actually met through a different Patriot Rider. My dear friend, Lisa Stein, whom I have known since the 7th grade introduced us. 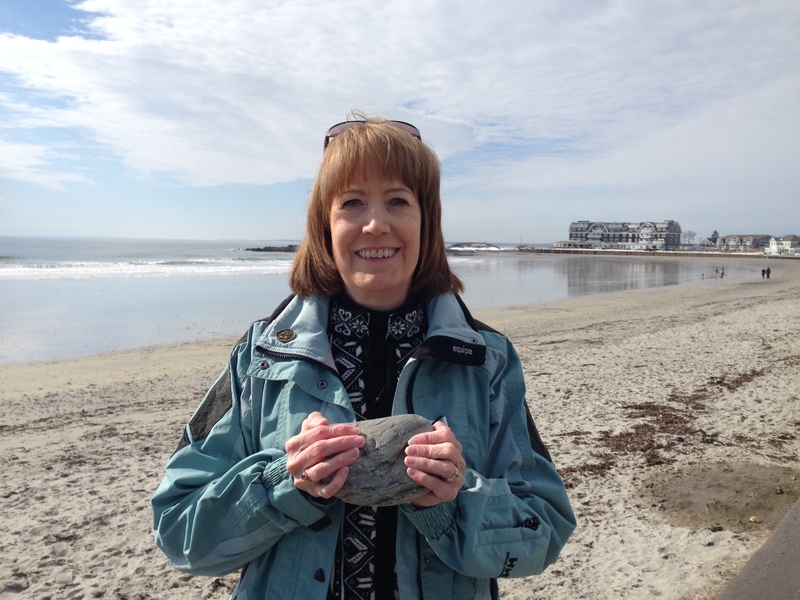 A memorial in honor of your memory was created from a stone which was collected from a beach in Kennebunk in which you, Betsy and Samantha frequented often. It was this stone that Lisa was going to transport, but bestowed the honor upon me. I hope you don’t mind. She and I have shared a lot of things through the years……clothes, laughs, growing pains and a slew of memories that will now include a four pound inscribed stone. You were transferred from her hands to mine. Immediately I felt the need to know who I was representing and sharing my time with. I was so grateful for the video commentary that your wife created. It gave me the opportunity to catch a small glimpse of your life through her eyes. It truly is one of life’s harshest ironies that we sometimes don’t get to know and meet people of great character and integrity until that opportunity has passed. We learn of their greatness and legacy through someone else’s story. Chris, I’m sorry that we met under these circumstances. But, you truly need to know that so many of us appreciate the selfless spirit in which you gave your time and attention to protecting this country. Our gratitude can only be relayed by keeping your memory alive ….and you are very much alive in our hearts. Godspeed. I had the honor and privilege to participate in another TSP hike carrying the stone of 1SGT Christopher D. Coffin. This will be the third time that I’ve been able to be involved with a TSP event and Chris’s stone. After my initial hike at BSP 2014, I made a promise to Betsy that I would always remember his story and pass it along. Staying involved with TSP has given me yet another opportunity to do that. Because of that promise, and due in no small part to inspiration taken from the Lake Region High School students, I wanted to present the idea of a hike to my daughter’s small private school. My experience with TSPatBSP 2014 and then helping with TSPatBVDP were overwhelmingly positive events. I wanted to share TSP with others so that we could all continue the mission to honor, always remember and share the burden in some way with families of the fallen. Dave gave me the ok to proceed and we announced the idea of a snowshoe hike to the upper class students of HCA. After some informational meetings and posters were displayed we had a team of about 13 people that wanted to participate in the hike. One of the aspects of TSP is to carry the weight during a physical activity. I think it’s important to feel the stone with you and remember your fallen hero, and the weight of that sacrifice. It’s a very significant physical representation of the weight these families feel. Because of that, I specifically chose to do a snowshoe hike as a bit of a challenge but still safe and within reach of as many people as possible, regardless of their physical abilities. My youngest son Shawn (11) had been with me at a previous TSP event, but had never carried a stone. He wanted to carry one but was nervous about the weight and his ability to snowshoe since he had never done it before. We finally decided to carry 1SGT Christopher Coffin’s stone together, he would carry it up and I would carry it back down. The hike began with a steep incline heading up the trail, it didn’t take long to get tired and winded. Shawn did really well, I know he was nervous about his ability to snowshoe, but his spirits were high and we all stuck together and made our way up the mountain. He carried a very small pack, with his water a few snacks and Chris’s stone. When we had climbed nearly to the top, some in our group had to turn back due to injury and strain, he told me; “Dad, if this hike wasn’t for TSP, I think I would have quit and gone back by now.” He really was tired and felt like he didn’t have much energy left, but thinking of Chris and the TSP mission kept him going. It made me proud and happy to see him push himself to go beyond what he thought he could do. Shawn and I were the last ones off the mountain for the hike, but he did it, and we thought a lot about Chris along the way. It was awesome! Yet again, even in these small ways the life of a fallen hero is having an impact on the lives of us today. How cool is that!? Not only are these heros always remembered, not only are their stories not passing away with them, not only are the families comforted by the fact that we honor and respect them and let them know that their sacrifice mattered – but through The Summit Project, these men/woman continue to have a significant positive impact on the lives of people they have never met. I don’t know of a better way to honor their sacrifice. I had the extreme honor of hiking with your husband’s stone during the Summit Project event at Baxter State Park. I watched the video you made with Maj. David Cote several times and was touched by the connection you and your husband shared. You were definitely a team. As I hiked, I thought about how you said he always took care of his men and of his kindness to others. When I spoke about him at the summit, the story I used to explain his nature was the story of him rescuing the puppy that you two then raised for 18 years. I also spoke of your love for him and how proud you were of his 23 years of service to his country. You are in my thoughts and prayers and I want you to know that I may have only carried Chris’s stone for a day but I will carry his story for a lifetime. Your sacrifice and your loved one will not be forgotten. I am writing this post to let you know on Friday, 29 MAY I had the honor to carry 1SG Chris Coffin’s stone on a day hike at Bigelow Mountain in Stratton, Maine. Carrying 1SG Chris Coffin’s stone was an incredibly inspiring experience that I will not forget. We were very fortunate to have excellent hiking conditions. During the hike I took the time to reflect on the sacrifices that both 1SG Chris Coffin and all of our nation’s service members have made. It was a powerful experience to know that the stone I was carrying represented the sacrifice of 1SG Coffin and with every step I was reminded of the heavy load that Chris Coffin’s family, friends, and all those who were fortunate enough to have known him carry on their shoulders each and every day. From what I was able to read about him he was an incredible person who touched the lives of all who knew him and an inspiring Army leader who set the example of “Mission first, people always”. It was very humbling to be part of The Summit Project and be part of something bigger than myself. It was even more humbling get the opportunity to honor and help ensure that 1SG Chris Coffin’s memory both as a loving husband and as a caring Army leader who put the welfare of his soldiers first, is not forgotten. Thank you for making it possible for me to participate in this experience. My personal library includes a couple of books by Quentin Reynolds. One title is Known But to God, and the book chronicles the developments that brought about the memorial to the Unknown Soldier at Arlington National Cemetery. I read it decades ago and, as I sometimes do with books that have moved me, I recently re-read it — this year, in fact. I had an uncle who was killed in Korea in 1952, and his widow just died this past November. It was after that when I took the book off the shelf and re-read it. The phrase that is the book’s title came to mind as I was doing my research on First Sergeant Christopher Coffin. You see, I was privileged to carry his stone as it passed through Lincoln, Maine, last Friday (on August 7, 2015), for The Summit Project. Chris was born a year after I was. At nineteen he joined the Army, a year after I did, and by 1971, trained as a tank crew member, he was on duty in Germany, a year after I arrived there. I had no occasion ever to meet him, though, so far as I know. I finished active duty in 1973, Chris a year later, but then he joined the Army Reserve. I had been in the Army Security Agency, but I did not remain in the Reserve. My period of active duty, during the Vietnam war, was relatively uneventful. Because of the travel afforded by my training and assignments, especially to California and Germany, I could describe it as more of a vacation than a military challenge. (I signed up for four years but was released after three, due to the wind-down in Vietnam and the concomitant reduction in force.) I’ve never felt, nor been made to feel, that my service was of lesser value or that I didn’t give enough. I would have been drafted if I had not volunteered, and, as surely Chris did as well at the time, I understood that I was available to go to Southeast Asia at any moment, regardless of my present assignment. I am eternally grateful to John Milton for his brief poem that ends with the line: “They also serve who only stand and wait.” For they who stand and wait are the ones who could be next. They are the support for the ones at the front. They are available and know it. The choice is not theirs to make. Chris volunteered for Iraq, inasmuch as he was voluntarily a reservist. In my research I found Hal Bernton’s Seattle Times article from 2005, documenting the question of accident versus ambush. While Chris’s very presence in Iraq commands my deep, deep respect, the Army’s dismissal of his death as an accident only deepens my disappointment in military administration. I was involved in a similarly-misreported incident on my base in Germany in 1973, when nearly two dozen soldiers descended on a group of four others, including me, and beat us up. The details are of no concern now, but the record (if one still exists) says the smaller group instigated the fracas, implicating me, which in turn affected who was punished for it under Article 15. The record is wrong, just as it remains for Chris, and neither of us will never change that. Chris’s obvious awareness of personal danger, made plain in a call to home in the month before he died, brings to mind my uncle’s letters home from Korea, of which I have copies. He, too, sensed too well that he was in mortal danger, and he too was right. I volunteered to participate in The Summit Project just so that I would become acquainted with, and carry the memory of, a fallen soldier. I now feel as though I did know Chris a little, and I like to think that in truth we may have exchanged glances at a Kaserne in Germany or on the streets of, say, Frankfurt. Whether we did is known but to God, and whether the Army’s official conclusion about his “accident” is true is also known at least to God as well as to those who were there. And it is their word that matters, to me and to those who will learn of Chris through me. Just as with the Army’s record of my own misfortune, the official record of Chris’s last moments will become lost in the indistinct cacophony of the Army’s own self-praise, which no one ever really listens to. I was a soldier and I can be proud of that. But I am humbled by fellow soldiers such as First Sergeant Christopher Coffin. No matter with what disregard we may be treated, the Army is nothing without us. I am proud to have carried Chris’s stone and to become a spokesman for his story of service and sacrifice. I had the honor of carrying the stone and story of your husband 1st Sgt. Christopher Coffin as I hiked Cadillac Mountain. Although his stone was chosen for me, we have a saying in The Summit Project family; the stone choses you. I watched your video and listened to you talk about Chris and I felt a connection right away. I was chosen to be a Team Leader for the hike to lead Team Tarn. We were 20 individuals, most of us had never met before and I needed to get them up the mountain safely so that we could honor our fallen heroes. During the many weeks leading up to the hike I sent out emails, updated the Face Book page trying to get us working as a team right away. I thought about the traits that made Chris a great leader. How he put his troops ahead of himself and looked after them. I tried to embody that as I lead the team. I wanted everyone on my team to feel like family and have a very meaningful experience. I feel like I was successful doing this, which was another way to honor Chris’s memory. He really fueled my passion to lead. The other connection that Chris and I have is that I am a Police Officer with the Rockland Police Department where I have been for 16years. Being a police officer just like being in the military you are bound by a brotherhood, even if you’ve never met them. I read the comments that some of his soldiers had to say about Chris and it was obvious he was a leader that they wanted to follow and he was well respected. Any time I am placed in a leadership position going forward I will think about Chris and make sure I am following his example of what a leader should be. I will not only carry Chris’s story in my heart, but I will continue to share it with other people. I have no doubt that I am a better person for having Chris touch my life in this way and his spirit will always live on. The day I was selected to carry Christophers stone I went to work researching him. As I read about him I cried. I cried because he was such an amazing man. I cried because as a military wife we dream of having men like him watching over our husbands. His caring personality. His sense of humor. The way he put others before himself. I was honored to have his stone with me for two events on November 8. A veterans 4 mile race followed by a 4 mile hike up Blue Hill mountain. I loved telling people his story. I loved retelling the stories I watched his wife Betsy tell in the video. How he cared for his soldiers. How he left Betsy notes at home when he was away. How he helped stray dogs he found. I never imagined I would connect with him the way I did. . I felt like I had known him my whole life and I was so proud to share every detail I knew to everyone I saw. I will continue to share the stories. Because of TSP I will forever hold a place in my heart for him and he is a MAINE HERO THAT WILL NEVER BE FORGOTTEN. People in my group and I were honored to carry the rock of Christopher D. Coffin up Bradbury Mountain. Christopher has a very interesting biography and it seems like he was a very good guy. I was born in Russia and lived there for 13 years and it was pretty cool to learn about a soldier from a different country. A lot of my family members were a part of the military or still are serving for my great country. After I started my research, it made me think of going into the military. I think it takes a lot of bravery to go to the military and especially fight in the war. I liked the hike very much and it was my first time being there as well. I loved the view. After we walked around on the top and took some pictures, we all made a big circle and started sharing information about everybody’s soldier. I liked it because when we got up to the mountain everyone had fun and talked, but when it came to talking about the fallen ones, everyone got serious and quiet and people cared about what every soldier did. We shared Christopher’s story to everyone at the top of the mountain. If I ever could have met Christopher in life, I would have loved to do that. I would love him to teach me about what’s going on out there in places where normal people are scared to go to. I’m very sorry for your lose and I couldn’t imagine losing someone this important to me. On December, 4th I was honored to carry your husband’s memorial stone up to the summit of Bradbury Mountain. While I was hiking up the mountain I was thinking about how you said he liked being outdoors and how much he would of liked hiking up the mountain. In my American literature class I had to do a project on Operation Iraqi Freedom. I learned about how we invaded Iraq to hunt and kill Saddam Hussein. I am also reading a book called Sunrise over Fallujah which is a fictional book based on a solider named Robin, a young man serving in Iraq around the same time Saddam was killed. It gives the reader a different perspective of the war that was going on. On this trip up, I was thinking about how much people are putting at stake when they go into combat and even when they come out. I was thinking about what my dad was telling me about what he saw when he was flying over Baghdad and when he was on the ground in combat. Going on this trip I reflected on your Christopher’s 23 years of service and the sacrifices he made and the impact of soldiers fighting to protect our country and keep us safe. I would like to thank him and all of the other veterans who have served and who currently serving this country. I would like to say all those who have served this countries are real life super heroes. Not all of them are treated like such, but they should be because not everybody is willing to put others before themselves like Christopher was. This experience will change my perspective of veterans and war. I will remember this event forever. It was an honor to carry the stone of Christopher Coffin because of all of the things that he did, including serving in the Army. One thing that I liked learning about Chris was that he had a satellite phone so he call his wife Betsy every night and how he let his troop call their families. Today I had the honor of carry the stone and story of this great man. What an incredible experience , as I carried his stone I tried to envision how he would have felt to have seen so many wonderful people thanking him for his service. I will never forget that he continues to give of himself to all the lives he has touched and continues to touch with this amazing Summit Project. I had the honor of carrying your husband’s stone as a hiker on May 29, 2016 at Baxter State Park. It was a privilege to learn about him and tell others about a great man who enjoyed the good things in life like peaceful times at Kennebunk beach. In today’s world we worship and celebrate people who have done little to earn it. I can’t put into words what it meant to have the opportunity to honor your husband, how he lived his life, and how he sacrificed so much for us. I want you to know that I didn’t just carry his stone one day. I will feel the weight for years to come. I will remember and I will continue to tell 1SG Coffin’s story. I wanted to say thank you so much for wanting to share Chris’s story. The summit project is an amazing project and I am so glad I had the opportunity to participate by carrying Chris’s stone. I am a counselor at a camp for military kids of all branches in Maine. This camp provides another family for many individuals, including me. This week I worked with the “cadets” and as a group we hiked Table Rock Mountain in Grafton Notch State Park. During the hike I carried Chris’s stone with my hands. I wasn’t sure how having a stone would physically alter the hike. There were a few times I lost my balance since I was using my hands to hold Chris. I was surprised how at the summit when we shared who we carried how much I felt toward Christopher. I really wanted him to know him to the best of my ability. I feel a big factor was that my dad was also in Iraq in 2003 and I am so lucky that he came home. Again, I would like to thank you for participating in the Summit Project and indirectly allowing me to participate. I am glad that I can be a part of group of people who will be keeping Chris’s story and memory alive. It is with great appreciation and gratitude that I write these words. Thank you for the honor and the privilege of carrying the stone of your loved one, Christopher D. Coffin on October 1st at Acadia National Park. Although I never met Chris, the person he was came alive to me through my research and interactions with Betsy. Chris was a hero, a fearless protector, a loyal friend, and a loving husband. He embodied many character traits that I strive for in my own personal life: he put others first, he led with courage, and he also let those he loved know. His ability to live in the moment and feel gratitude is something that resonated with me as I hiked up Cadillac Mountain. As I began to feel discomfort and fatigue, I thought of his ability to appreciate each breath and each moment. I chose to push away the pain of my sinus cold and lack of sleep and feel gratitude for the opportunity for moments to remember. I am blessed to have the opportunity to remember people like Chris, who gave their life so I can hike mountains, teach children, and sleep safely each night. The legacy of Chris’s character lives on in those that learn about him and continue the mission of TSP. I believe that through getting to know him, I am a better person. I carried your husband’s stone up The Owl in Baxter State Park over Memorial Day weekend. I am embarrassed to say I did not do Christopher justice during the circle ceremony. In planning for the hike, I mistakenly thought I was carrying Christopher Cash’s stone and did my research about his life, career and passing. The morning of the hike a had a small 3 x 5 card provided by TSP that said Christopher had died in a car crash. When I got home and did more research, I realized there was much more to his story. I know he served his country for 25 years. I know he wanted to retire and return home to you. I know that his choice was to be state-side for his last stint. I know that he continued to serve the Army’s commands by going back to Iraq. Christopher was killed by enemy-fire, not in a car crash as originally thought. This must have been extraordinarily painful for you to endure. To not only deal with his passing, but to have to recount the details time and time again until officially having classified as a combat-related death. The memory of Christopher lives on…and I would like to ask your permission to carry his stone on the next hike. He was a hero for 25 years, and deserves to be recognized and memorialized as such. My name is Lisa Jean, and on Saturday, October 14, 2017, I had the honor and the privilege to carry the stone and the story of Army 1Sgt. Christopher Coffin, to the summit of Cadillac Mountain in Maine. This event was part of the TSP at ANP 2017 group event. I want to offer my deepest sympathies to 1Sgt. Coffin’s wife Betsy. Christopher D. Coffin had planned to retire from the Army Reserves, wanting to spend more time with his wife, Betsy, in Kennebunk, Maine. “He made a commitment to my sister to spend their older years together and not to put himself in jeopardy, where there’d be any chance she’d have to suffer through what she’s going through now,” said his sister, Candy Barr Heimbach. But that plan was put on hold because of the war. Coffin, 51, died July 1 in Iraq in a vehicle accident, possibly while under attack. Heimbach described her brother-in-law as devoted to his wife, family, friends and country. Chris was an avid skier and spent much of his vacation time with his wife Betsy skiing in the Rocky Mountains of Colorado. In his civilian work, he had been a police officer for many years. In 1998, he transferred to the Department of Defense as a Federal police officer, and had worked at several U.S. military installations, including the Pentagon and Fort Detrick, Md. He worked for the Department of Defense as a policeman at the Portsmouth Naval Shipyard in Kittery, Maine. In his Army work, Coffin is best remembered for his stern, but fair, attitude and his constant concern for the well-being of his company of soldiers and officers. Chris seems like the kind of friend that we would all like to have. Dedicated family man, adventurous, hard worker, honest and would help anyone that needed it. It was an honor to speak of Chris during my circle ceremony at the summit of Cadillac Mountain. I found it hard to write after sharing this past weekend with Christopher, so I recorded my thoughts. Thank you for your patience with the formatting…..
To the Coffin Family, I carried the stone and the story of Christopher this past weekend from Hamden Maine to Millinocket on the Summit Project ride. It truly was an honor to do so. We/I will never forget this experience nor will I ever forget his name. God Bless you and your family, and Thank you. On Memorial Day weekend, I had the honor and the privilege of carrying the stone and the story of Army 1st Sgt Christopher Coffin to the summit of Owl in Baxter State Park where my group paid homage to Sgt Coffin for his service and sacrifice. Prior to the hike I spoke with Sgt Coffin’s widow, Betsy, about her husband, his service and commitment to the ideals of this country, the wonderful years they spent together since they met in college, and the dreams they shared for retirement that ended when Sgt Coffin lost his life on July 1, 2003 as a result of hostile fire while on deployment in Iraq. From our conversation, I learned that Chris grew up in NJ, and the values instilled in him through his family and life experiences shaped his character in positive ways, informed the choices he made as he grew up, and called him to a life of service. Chris was dependable, a person one could count on to see things through from beginning to end. He was an outdoorsman – partial to hiking and skiing, and always in search of adventure. Chris was kind and generous, a friend to stray animals and to people who strayed. He was a history buff who loved life and he loved living. Chris joined the army at age 19 and with almost twenty-four years in service was set to retire when a stop loss order was issued due to the war in Iraq and he was deployed along with his reserve unit, a civil affairs team. Betsy said that he wouldn’t be who he was if he hadn’t have gone,” committed as he was to the safety and well-being of the men and women in his unit, to being a mentor, to leading by example, and leading from the front. I thought about Sgt Coffin the entire length of the hike and beyond – what he stood for, what he gave up to remain true to his values, and what he gained by doing the same. When I struggled with the weight in my backpack that day, I kept thinking about how difficult it can be to choose to do what is right over what is easy. I imagine there were times Sgt Coffin struggled with this as well. But choosing to do the right thing defines integrity and is the cornerstone of the character that Sgt Coffin embodied. Betsy said that Sgt Coffin wasn’t perfect, but he strived to do what was right and genuinely left this world a better place. My hike in Sgt Coffin’s memory and the summit memorial service was a wake up call and a reminder for me to go and do likewise. Betsy, I am so sorry for your loss, and appreciate your faith in me to honor the memory of your husband by carrying his story along with his stone. Blessings.